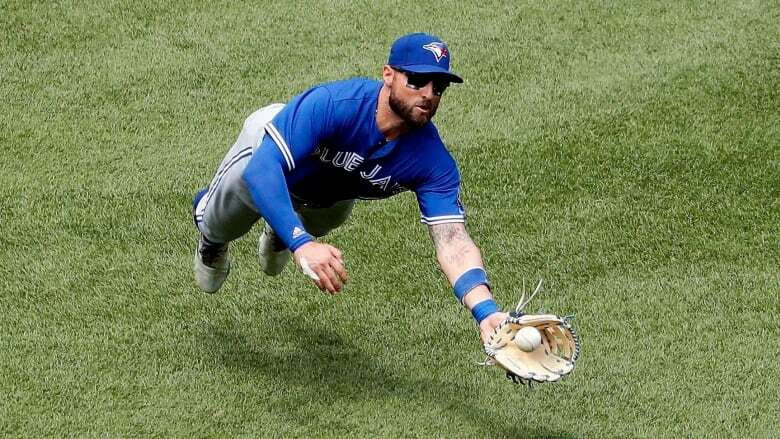 The Toronto Blue Jays have traded popular centre-fielder Kevin Pillar to the San Francisco Giants for right-handed pitchers Juan De Paula and Derek Law and infielder Alen Hanson. Emotions ran high Tuesday as the business of baseball resulted in a popular piece of the Blue Jays locker room being removed. Toronto continued its radical roster makeover, sending veteran outfielder Kevin Pillar to the San Francisco Giants for three players. In a separate move, the Jays obtained speedy outfielder Socrates Brito from San Diego. Later Tuesday the team signed outfielder Randal Grichuk to a $52-million US, five-year contract extension. In return for the 30-year-old Pillar, the Giants gave up right-handed reliever Derek Law, utility infielder Alen Hanson and right-handed pitching prospect Juan De Paula. Jays first baseman Justin Smoak had a hard time controlling his emotions when asked about seeing his close friend depart. "He was great, man. Good teammate. Superman. Whatever you want," said Smoak referencing Pillar's nickname for his ability to climb high and make highlight-reel catches. "He's a guy you want on your team," added Smoak, his voice breaking. "Sorry I'm getting emotional." Pillar, a California native who was the longest-tenured Blue Jay, has been in the Toronto organization since being drafted in the 32nd round in 2011 — which netted him a $1,000 bonus US. He went on to play 695 games for the Jays, hitting .260 with 55 home runs and 231 runs batted in. Toronto GM Ross Atkins paid tribute to Pillar's work ethic and determination. But he said the "difficult decision" to deal the veteran makes room for others to step up. "This was a deal that we felt made sense to gain [financial] control and create opportunities for others," he said. Pillar did not start Monday's game against Baltimore but delivered a pinch-hit sacrifice fly in a ninth-inning Toronto rally that fell just short in a 6-5 loss. Atkins said the deal was consummated late Monday. He acknowledged nodding off, only to be awoken by a vibrating cellphone providing confirmation of the trade from Giants president of baseball operations Farhan Zaidi. Pillar got the word Tuesday morning and was on a plane later in the day. "It's definitely an emotional time for me and my family," a visibly moved Pillar said. "You spend a lot of time here. You spend more time [at your baseball home] than you do at your home in the off-season. I spend more time with people here than I do with my own family." Pillar is a three-time Gold Glove Award finalist (2015, 2016, 2017) and earned the 2015 Wilson defensive player of the year for centre-field. "We're excited, really excited," Giants manager Bruce Bochy said. "He's somebody that's been on our radar for a while, and to have him here to help out, he'll give us plus defense, another bat, experienced guy. The energy level that he plays at, I'm looking forward to getting to know him and watching him." One of his best catches occurred during the famous 2015 Game 5 victory over the Texas Rangers in the American League Division series. Pillar hit .252 with 40 doubles, 15 home runs and 18 walks over 142 games last season. He batted .260 with 156 doubles, 55 home runs and 231 runs batted in across 695 career games with the Blue Jays. Hours after the trade, the Blue Jays recalled outfielder Anthony Alford from triple-A Buffalo. Pillar, who is making $5.8 million US this season, is eligible for free agency in the fall of 2020. He joins Russell Martin, Marco Estrada, Troy Tulowitzki, Kendrys Morales, Josh Donaldson, Steve Pearce, J.A. Happ and Yangervis Solarte in a Toronto teardown that started last season departing the Jays. "We're not in a popularity contest," said Atkins. "We're in a contest to win championships and that takes making tough decisions and often times not popular ones." Pillar's time in Toronto was not always smooth. In May 2017, the Jays suspended him for two games for a homophobic slur directed at an Atlanta Braves reliever. But Pillar stood up and took his lumps, apologizing to fans, Major League Baseball and the LGBTQ community. De Paula, 21, is a minor leaguer ranked 19th among Giants' 30 prospects by MLB Pipeline. A native of the Dominican Republic, he will be sent to single-A ball. "He's a young, exciting arm with a mid-90s fastball, the [arsenal] to strike guys out and the attributes to potentially be a starting pitcher. Those attributes are hard to acquire," said Atkins. "We can't possibly have enough depth when it comes to [pitching]." De Paula started last season with the Class-A Staten Island Yankees before being acquired by the Giants in the Andrew McCutchen trade. He was then assigned to the Class-A Augusta GreenJackets. The six-foot-three 165-pounder had a 1.72 earned-run average with 55 strikeouts and 27 walks over 52.1 innings of work last year. He has a career 13-14 record and 2.47 ERA in 48 minor league games. The 26-year-old Hanson hit .252 with eight home runs across 110 games for the Giants last season The six-foot 170-pound switch-hitting infielder has a career .238 batting average with 12 homers and 51 runs batted in over 243 games. "He's a versatile and still young infielder. He's as close to a super utility player as you can find," said Atkins of than capable of playing second base, shortstop, third base and the outfield. Law, who had a 7.43 ERA across 13.1 innings with 12 strikeouts and eight walks for the Giants in 2018, "most likely" will report to triple-A Buffalo, according to Atkins. Over the last three seasons with San Francisco, the six-foot-three 215-pounder has a 9-3 record with a 3.83 ERA and 97 strikeouts in 105.2 innings. The Giants are in Toronto April 23-24.